In the history of the farm Strasserhof, the cellar with the most northern vineyards in Italy, there is a before and after, with 2003 as a watershed year. Before, the grapes were given to the nearby winery of the Abbey of Novacella which, together with the Cantina Valle Isarco, produces most of the excellent local wine; later, with the entry into the company of Hannes Baumgartner, the farm begins to bottle with its own label and today production stands on 50 thousand bottles, for about 6.5 hectares of vineyards, which surround the farm and are planted at an altitude between 650 and 800 meters, on sand and gravel soils. The important thermal excursions they favor the development of aromas and give wines with a strong alpine character. Hannes specialties (and the area in general) are the whites: whether it is riesling, kerner, müller thurgau, gewürztraminer, grüner veltliner or sylvaner, in the glass the pure and crystalline expression of the Isarco Valley is found intact. Difficult to choose which is the best label, but after years of tasting, I think that the wine that best represents the character of Hannes, joyful and a little shy, smiling and with an impeccable oenological preparation, is the Sylvaner, who in the cellar is declined in two versions, a more important white, born from the oldest vines and dedicated to parents, and one of the entrance, which has an easy and overwhelming drink, without giving up grace and elegance, with its fruity notes of citrus, apple yellow and banana, mixed with so much, so much freshness and flavor. Definitely worth a visit also the farm, which dates back to 'Eleventh century and it is in a secluded and very idyllic position: thanks to some rooms in formula B & B, it is the best place for a weekend of total relaxation. In addition, between mid-September and late November, hospitality is enhanced by the Buschenschank, a classic South Tyrolean rural tavern where you can taste the törggelen, the snack / typical dinner made with dumplings, barley soup, cold cuts, sausages, chestnuts and new wine. Why now: It is the ideal aperitif after a day on the ski slopes. As did: after the harvest, which takes place around the middle of September, the wine matures for 7 months, 70% in steel and 30% in large oak barrels. To combine with: risotto with vegetables, stuffed zucchini, fresh cheeses, ravioli di magro, scampi and crustaceans. Serve it to: 8-10 ° C.
The Christmas call, theSouth Tyrol He responds. It does so with its enchanting mountains that whitens to party, with unique atmospheres that can be breathed in the alleys of its towns and with those Original Markets that have always been synonymous with upcoming parties. From Bolzano to Brunico, passing through Bressanone, Vipiteno and Merano, and then continue through all the many magical places scattered over the most beautiful views of the Dolomites. Until 6 January, walking among the traditional wooden houses will be possible to immerse themselves in the excellence of South Tyrolean craftsmanship, but also rediscover all the tasty charm of the gastronomic traditions of Südtirol. 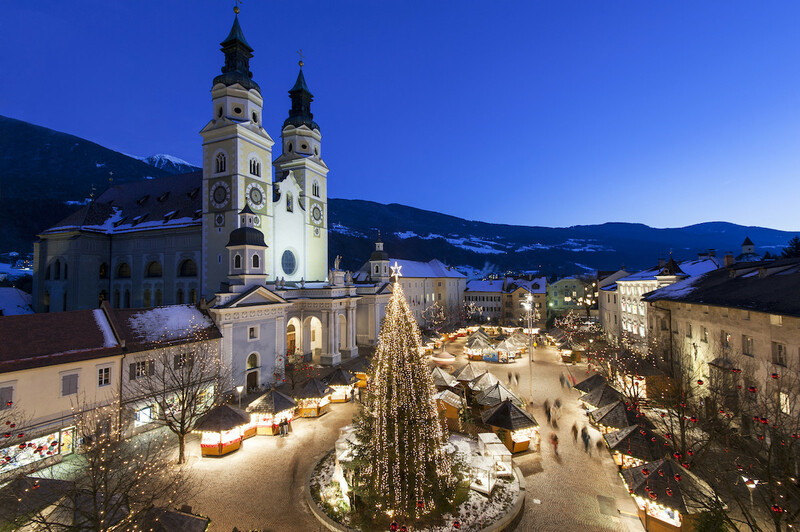 Night falls on the Christmas Market around the Cathedral of Bressanone, illuminated by Christmas chains of candles (photo courtesy Alex Filz). All ready, then, for a taste of cheese from malga, black bread, venison with polenta, apple strudel and strauben. Without forgetting, of course, his majesty the speck, able to combine in one slice the best seasoning practices typical of the Mediterranean areas and the use of traditional Nordic smoking. Yeah, because I Speck Alto Adige Igp It is a prestigious salami with unique characteristics: a boned, trimmed, dry-cured ham, left to dry and matured for at least 22 weeks. The result is a specialty that can only come from the 29 producers recognized by the Consorzio di Tutela Speck Alto Adige. With a particularly balanced taste: more delicate than the more rustic proposals of northern Europe and, at the same time, more aromatic than the classic sweet raw that can be found in other Italian regions. So let's see how to make the most of this product in the kitchen, in one of the recipes certainly more characteristic of the South Tyrol repertoire: i dumplings. Fry the onion in 2 tablespoons of extra virgin olive oil until it is golden brown. Chop the spinach and basil. Mix together bread, minced spinach, basil, chopped onion, eggs, milk, gray cheese, spelled flour, salt and nutmeg. Leave the dough to rest for half an hour. Meanwhile, cook the pumpkin in the broth for 20 minutes in a saucepan. Blend and season with aromatic herbs. Brown the speck into cubes with a drizzle of extra virgin olive oil. Divide the dough into 8 parts and form the dumplings. Cook over low heat in boiling water for 20 minutes. To serve, pour a little pumpkin sauce on the bottom of the plate, lay the dumplings and the speck into cubes.